It is quite fitting that I post this review today. I’ve just finished watching a movie that had me really emotional in its final act, and Ive been going through some rough times lately which means that my emotional bar is pretty low at the moment. And yet, this is the holiday of good cheer, and its the day of good cheer too, what with Santa dropping by shortly to deliver some Christmas presents for people who believe. In many ways, Frank Herbert’s sequel to his award-winning, critically-acclaimed and completely untraditional Dune is perfect reading material for Christmas because of what it symbolises. I’ll admit that three weeks back is the first time that I ever read Dune: Messiah. Since my high school library never had the book (the one copy we did have was extremely battered and completely unreadable as a result) and I never went back to read it for some reason. Always skipped it when I read the other books. Then last year I listened to the audiobook from Macmillan, and I was blown away by how poignant it was. The second half of the book really hits you hard with the emotions, and it never stops, even unto the end when you turn the last page. Its a novel about sadness and hope and a resurrection of sorts even. Easily one of the best books I’ve read this year, comparable to to Dune itself. For me, Dune was a life-turning moment. I say it a lot and I never get tired of saying it: Dune was a part of my formative SFF reading and I consider it to be one of the best novels I’ve read, ever. For a novel that I hold in such high regard, how does the sequel match up? If anything, Dune: Messiah is just as good as Dune. Where the first novel was about Paul Atreides coming to accept the mantle of Muad’dub, of being the Kwisatz Haderach, the sequel is about him coming to realise the true burden that being the fabled messiah is. He is drowning under those burdens, and he keeps fighting his prophetic visions. Dune: Messiah paints the picture of a man struggling against his destiny, and finding what joy he can in his regular life, despite all the political, religious, and economic drama that surrounds him. Frank Herbert did an absolutely amazing job going into as much depth as he did for Dune and Dune: Messiah is all about taking things even further, going even more detailed and more nuanced. That’s what I love about his work, and its the greatest charm of his work. The Dune-verse is an incredibly rich world where the fictional realism really pulls you in. Whether we talk about entire cultures, or galactic religio-political implications or denunciation of war and religion and what not, Frank Herbert is the kind of writer who can create that perfect atmosphere for you. He starts Dune: Messiah with a conversation between a historian and a newly-minted priest of Muad’dib’s religion. This thread continues throughout the novel and we get a really in-depth look at how the new religion works on Dune and what kind of implications it has had on the galaxy at large. But really, Frank Herbert transcends all of that with all the character study work he does with Paul, and Alia, and reborn Duncan and even Stilgar. Paul is the central character of course, and all the other characters are arranged around him like the spokes of a wheel. He is connected to all of them, and they to him. More than Dune, Dune: Messiah is indeed a character’s journey to self-discovery and the acceptance of what fate has in store for him. At the end, that’s what matters most to Paul. And its a brilliant journey. Several times in the second half, I was almost in tears. Frank Herbert’s writing is extremely emotional and in that second half he is at the top of his form. The way he constructs the atmosphere of desperation and hopelessness and helplessness, you can’t help but be moved. In that second half, I could really feel what Paul was going through, as if I was right beside him, or perhaps I was Paul. The audio version last year, with all its fantastic narration was moving enough, but Frank Herbert’s words themselves have a power of their own. Reading them creates its own magic. There are extremely few novels out there that have that kind of a power. And none of it is restricted to just Paul himself. Watching Alia skirt the same disaster that her brother does. Or watching Stilgar sit by, helpless to prevent the events he doesn’t even know about. Coming back to these characters is always cathartic to me, and Dune: Messiah proved that to me big time. These are all characters that I love reading about and since this was very much a first experience for me, its super-fun too. Its quite amazing really. I knew the broadstrokes of everything, but the details, its the details that get to you. No matter which character we talk about in this novel, whether Reverend Mother Gaius Mohiam, or the Dunan Idaho ghola called Hayt, or any of the other supporting cast members, they all have something to offer. Each character has his or her own place and within their established roles, they all shine. Frank Herbert is most definitely a master of characterisation, for this reader. The novel can often get a bit dark and even really cerebral, just like its predecessor, but its true that it is in those moments when Frank Herbert is at his finest. The amount of sheer mental work it must have taken to do all that research, all that working out to make sure that the discussions in the novel came across as realistic and worth the admission, it boggles my mind. It is the kind of work that I aspire to write some day, but the thing is that I look at the Dune novels and I realize that there can only ever be one Frank Herbert. He was a one of a kind. Dune: Messiah has slightly better pacing than its predecessor, and it flows along much more tightly, which adds to all the tension that Frank Herbert builds in this novel. When I get around to reading Children of Dune, my experience from Dune: Messiah is definitely something that I’ll be looking to match. Of course, I’ve read the novel several times previously, so I know what I’m getting into. But the thing is that reading Dune: Messiah has given me a whole new outlook on this series as a whole, especially with regards to the books that Frank Herbert’s son Brian and noted SFF author Kevin J. Anderson have put out to round out the entire series. To be surprised, to be moved to such a degree, for a prolific reader like me, that’s one hell of a valuable experience. And its not something I’m going to forget any time soon either. More Dune: Dune, Legends of Dune. 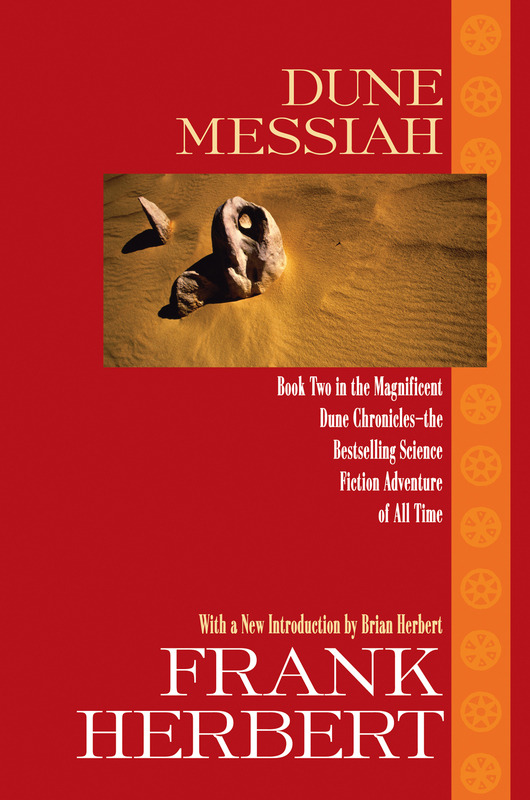 Posted on December 25, 2013, in Book Reviews, Review Central and tagged Advent 2013, Advent Calendar, Book Review, Dune, Dune Chronicles, Dune: Messiah, Frank Herbert, Paul Atreides, Prescience, Prophecy, Review, Review Central, Science Fiction, Space Opera, Thriller. Bookmark the permalink. 2 Comments.